Known as "The White City of the North" for its fine neoclassical architecture, the Finnish capital Helsinki on the shores of the Gulf of Finland offers an impressively high quality of life. It ranked 29th out of 215 cities in the Mercer 2008 Quality of Living survey. 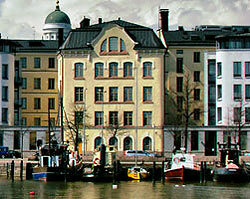 Helsinki is one of the world's safest cities; it ranked 2nd in personal safety. Helsinki is well-planned and boasts clean surroundings, minimal pollution, good environmental management, and advanced technology infrastructure. Its architecture is varied and fascinating. A few of the highlights: neoclassical 19th-century buildings on the Senate Square, early 20th-century Art Nouveau buildings designed by Eliel Saarinen, the Russian-revivalist Uspenski Cathedral, the Functionalist-style Olympic Stadium, and various Modernist structures by the noted Finnish architect Alvar Aalto. Helsinki has few really tall buildings. This is because the city generally restricts high-rises and buildings of over 12 floors. One notable exception is Cirrus, a 28-storey apartment building in East Helsinki. Green spaces occupy a third of the city's area. Much of the city was developed in line with the Finnish "garden city" aesthetic movement, giving a sense that the city is close to nature, in spite of its ultra-modern trappings. Parks and gardens that can be found throughout the city include the lovely Hesperia Park and the lively Esplanade Park, a promenade set between two busy thoroughfares. Its central park is the Keskuspuisto, which begins in the centre of the city and winds northwards in a long, narrow ribbon, touching various neighbourhoods until it reaches the Vantaanjoki River, which is Helsinki's northern border. Walking around Helsinki is a pleasant activity, and if you feel a need to ride, the city has a good tram network. The trams run along street tracks and are a picturesque means of local transportation. Helsinki commuters can also rely on the city bus system and the Metro. Out in the Gulf of Finland are several small islands, on which stands an impressive sight: Suomenlinna, a massive Swedish fortification built on six islands in the mid-18th century. While evidence of its military past can be seen in the cannons that face out to the sea, today Suomenlinna is a recreation area where people can go sightseeing or have a picnic. The cultural life in Helsinki is represented by its various museums and art galleries, several major theaters, the Finlandia concert hall, the National Opera, the National Ballet, classical and jazz orchestras, and the annual arts and culture festival known simply as Helsinki Festival. Helsinki is divided into 33 districts that are further grouped into seven major districts: southern, western, central, northern, northeastern, southeastern, and eastern. Among the 33 districts, Eira, Etu-Ta'ala, Kruununhaka, Kulosaari, Munkkiniemi, Tammisalo, and Ullanlinna are considered prime investment property areas.